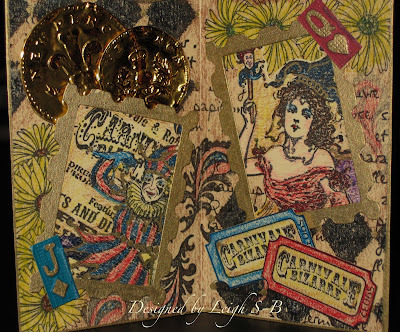 Velvet Paw Creations: Enter the Magical World of Carnival Bizarre featuring Blockheads Stamps! 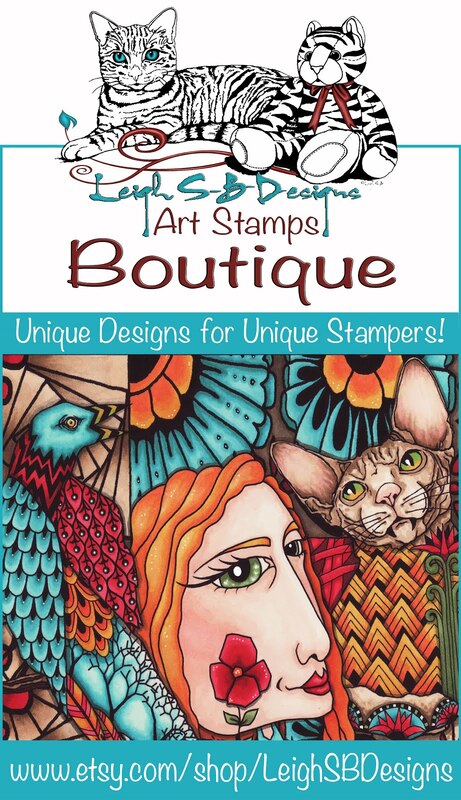 Enter the Magical World of Carnival Bizarre featuring Blockheads Stamps! Roll Up! Roll Up! 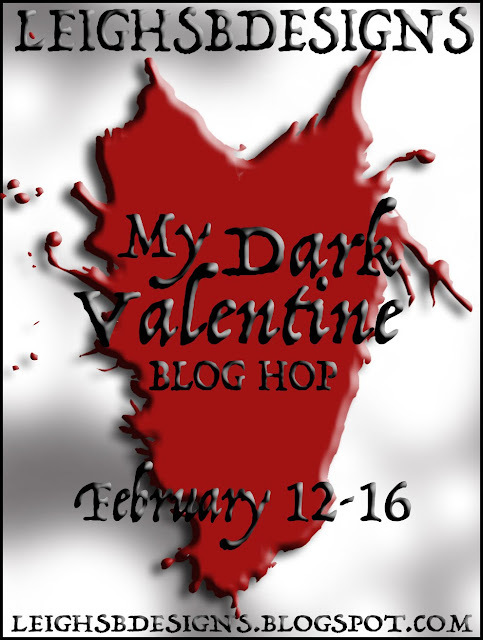 Get your Tickets Here! 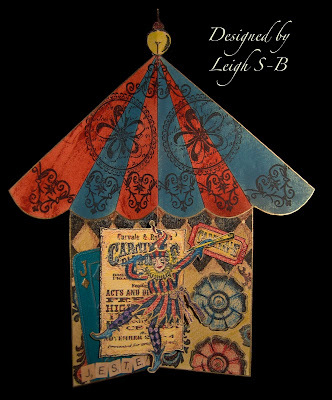 Enter the magical yet strangely peculiar world of Carnival Bizarre...if you dare! I'm so excited to share my latest Blockheads Design Team project with you all! 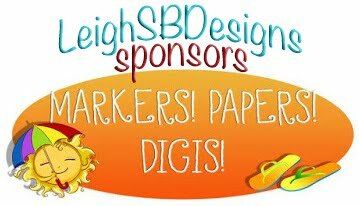 I've had a fabulous time designing a dimensional carousel-like piece housing 3 booths and showcasing a variety of Blockheads Paper Arts rubber stamps! So come with me and enter CARNIVAL BIZARRE! 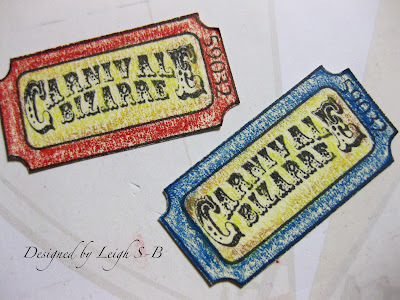 Draw the Carnival Booth panel 3 times in pencil on dark cream cardstock and randomly stipple Walnut Stain Distress Ink onto the lower sections just to grunge it up a bit. Mask off the right hand side of the first stripe of the Booth Awning with post-it notes and apply Fired Red Distress Ink directly to the cardstock to add dark texturing. 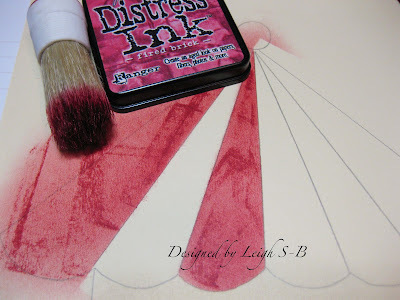 Then colour the entire stripe by applying the same ink with a stipple brush. Do the same to each alternate stripe. 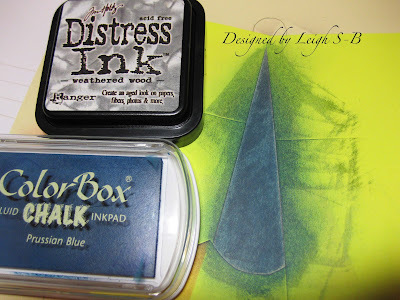 Apply Weathered Wood Distress Ink to the remaining stripes in the same way but this time I also stippled Prussian Blue Fluid Chalk ink over the Distress Ink to achieve the colour I wanted. Outline the Booth Awning with a black Sharpie and stamp a portion of the Flourish design onto each stripe with Versafine Onyx Black ink. I used post-it notes to mask each stripe again. 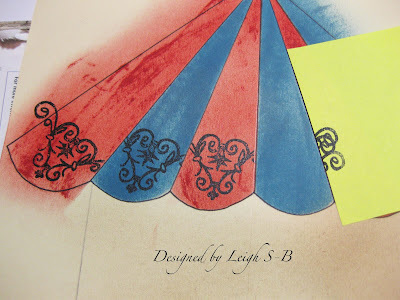 Stamp the whole Flourish image at the top of the Booth Awning and the two large flower medallions in the remaining space. 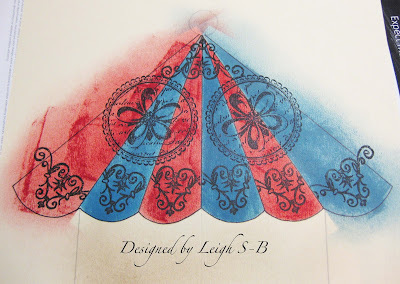 Do all the above steps on all 3 Carnival Booths and then cut out just the awning portion including the ball shape at the top. 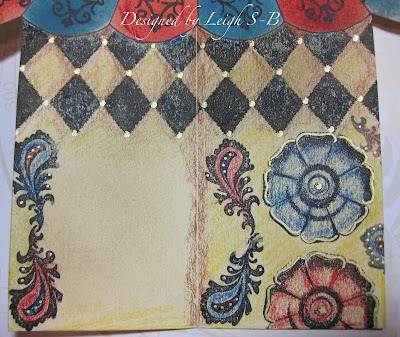 Leave a quarter or half inch border on the bottom sections just to help with the next stage of stamping. You'll know what I mean when you see the other photos. 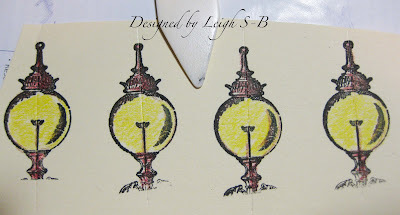 Stamp the Victorian Lamp Post 5 times onto the same dark cream cardstock. I stamped the whole lamp once and then just the glass light part 4 times. Colour them with Canary Yellow, Crimson Red, Sienna Brown and Indigo Blue. 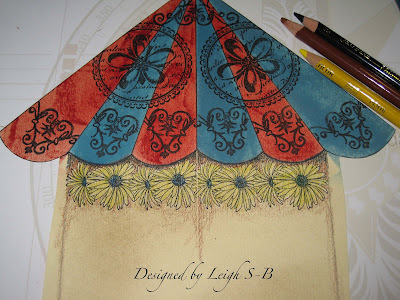 Add a touch of metallic gold to the filaments with a fine point PrismaColor paint pen. Score a fold line down the center of the 4 lights and the 3 carnival booths. 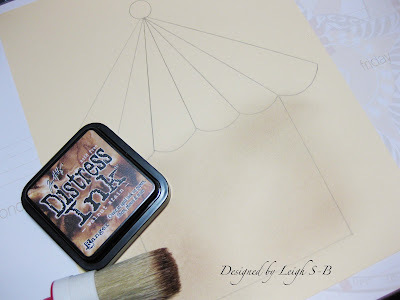 Cut out the lights and adhere to the circles at the top of each carnival booth with a glue stick. You can see the border I left on the bottom section there too. 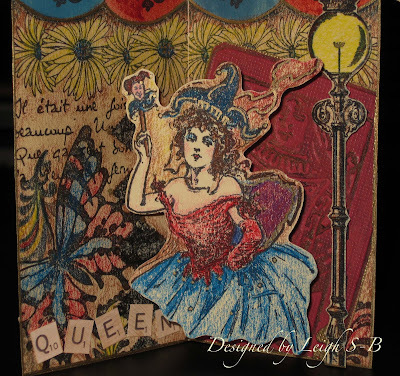 I embossed two Terracotta and two Stream pieces of Tim Holtz' Core-dinations cardstock with his Queen of Hearts and Joker of Diamonds Texture Fade embossing folders. I sanded some areas to reveal the core of the cardstock and also distressed them up a bit with an old black cube ink pad and also a touch of an old gold cube ink pad for a bit of grungy glam. I used old ones that are no longer juicy for a more dry-brushed effect. For a bit of bling I highlighted the card suites in metallic gold. Now for the Stars of the Show! 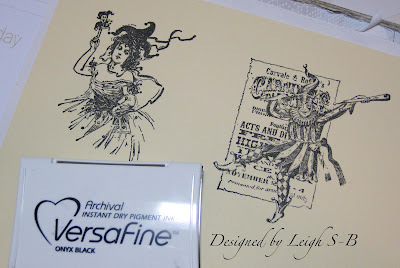 Stamp the Queen Fairy and the Jester onto the same dark cream cardstock in black Versafine ink and cut out. 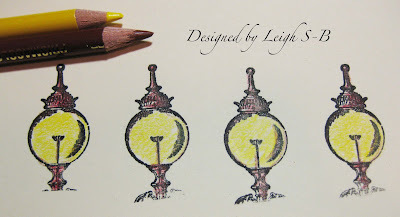 Colour the images and add gold detailing with a fine point PrismaColor metallic gold paint pen. 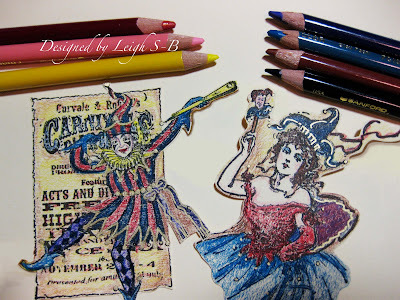 Stamp and colour 3 of the Carnival Bizarre tickets too and cut them out. 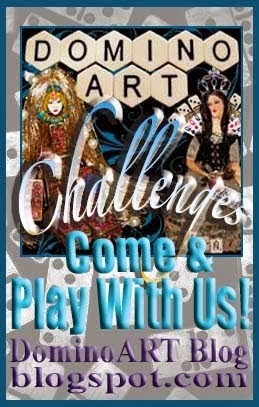 The first Carnival Booth is for the Queen Fairy so I decorated her space accordingly with a collage of various images. First create a mask of the awning scallops from post-it notes and mask that area off. Stamp the Daisy border in black Versafine and colour. 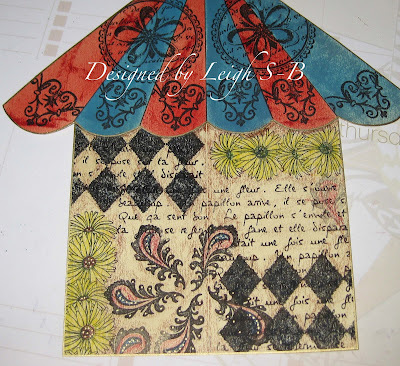 I then stamped the French Script, Diamond background, Butterfly and Flourishes and coloured them. 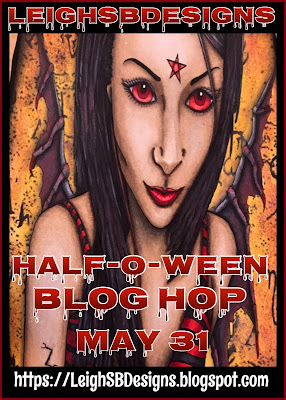 I pulled all the collaged images together with PrismaColor Sienna Brown. I added dots of metallic gold to the diamond background with a broad point metallic gold pen and small dots to the butterfly and flourishes with a fine point. 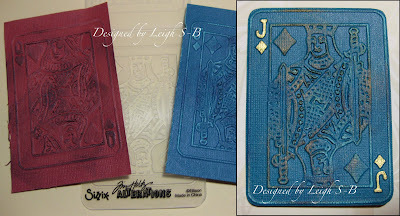 For the right hand side of her booth I adhered the Queen of Hearts embossed playing card at an angle and trimmed away the excess. I then cut out the bottom section, edged and outlined the entire booth in gold and folded the booth in half along the score line. 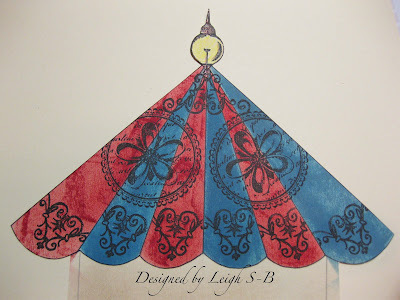 The second Carnival Booth is for the Jester and I decorated his space with the Diamond background, two large ornamental Flower Medallions and Flourishes - the dude does wear tights after all LOL! I used the same range of PrismaColor pencils to colour and added gold dots to the diamonds and details to the flowers and flourishes too. I Adhered the Joker card to the left hand side of the booth at an angle and trimmed away the excess. I then cut out the bottom section, edged and outlined the booth in gold and folded the booth in half along the score line. 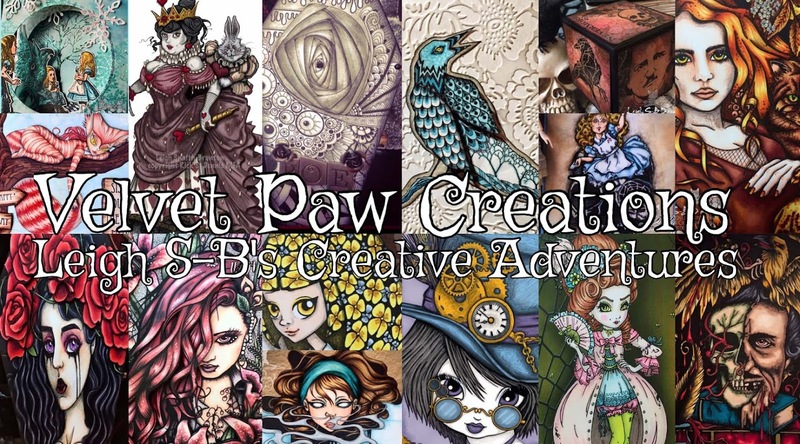 The last Carnival Booth I did is actually the 'Entrance' to Carnival Bizarre so I decorated that space with a collage of the stamp images I used from the two 'Star Attraction' booths and coloured them with the same PrismaColor pencils and paint pens. I then repeated the same process of cutting out the bottom section, edging in gold and folding along the score line. All the booths are now ready to be assembled together. This part was a bit tricky but I used a glue stick which gave me enough time to match all the parts together by wiggling them in place before the glue set too much. I trimmed away any bits that didn't line up or just camouflaged the areas with metallic gold paint pen. Now all the booths are ready for decorating! 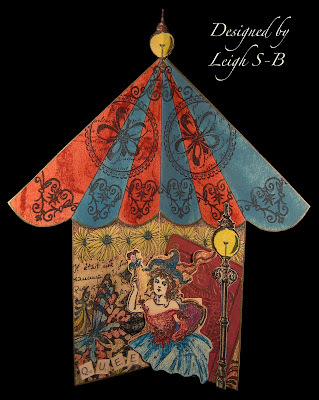 For the Entrance Booth I created framed posters of the Stars of the Show with a Sizzix postage stamp die and two more coloured images of the Queen Fairy and Jester. I coloured the frames in metallic gold and adhered the images to the backs of the frames with tiny bits of sticky tape and added the 'Q' and 'J' card suites from the two extra pieces I embossed earlier (which you can see in the photo below). 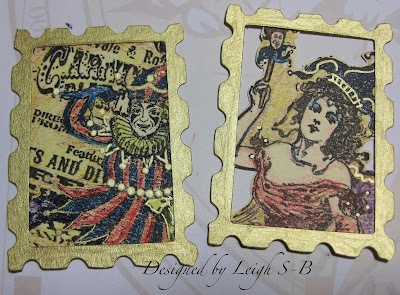 From my stash of ephemera I pulled out two gold English coins made of metallic foil that I'd saved from chocolate money and dulled the shine a bit with Chocolate Ancient Page dye ink and heat set the ink with a heat gun. I adhered all the pieces to the booth with a combination of dimensional glue dots and double-sided sticky tape. I mounted the Queen Fairy inside her booth by attaching her to one side with a 'Z' shaped folded tab made from dark cream cardstock. I attached the 'Z' tab to the back of her and then to the right hand side of the booth in such a way to ensure she folds outwards at an angle into the center of her booth. 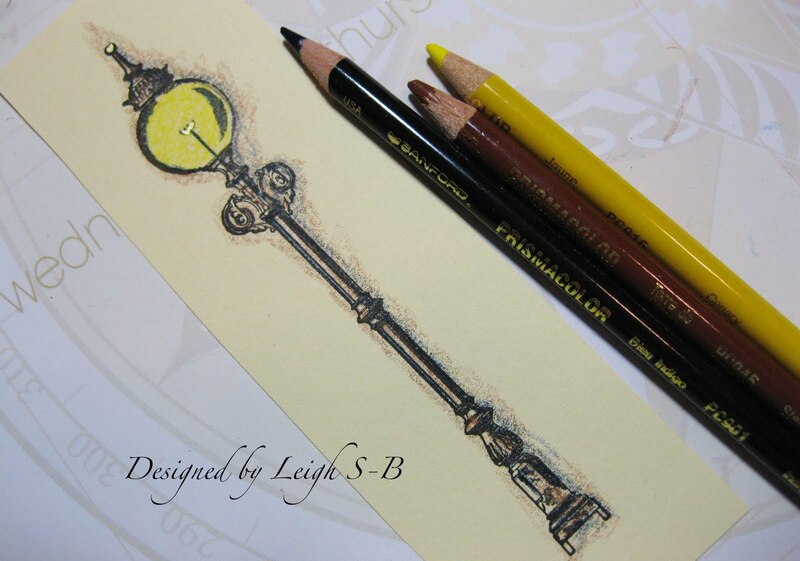 I adhered the lamp post with mini black pop dots for extra dimension. I finished off her booth with the word 'Queen' from my stash of tiny paper scrabble letters I made years ago for use in my DominoART. 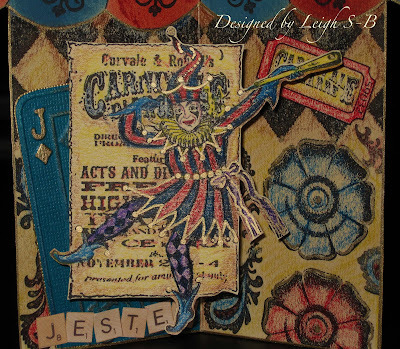 I added the Jester to his booth in the same way and included the word 'Jester' in tiny scrabble letters and a Carnival Bizarre Ticket too. 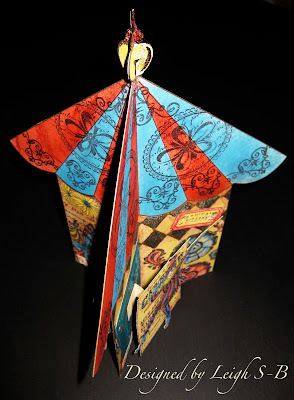 The final touch for the Entrance to Carnival Bizarre is a banner I made from a roll of attached tickets. 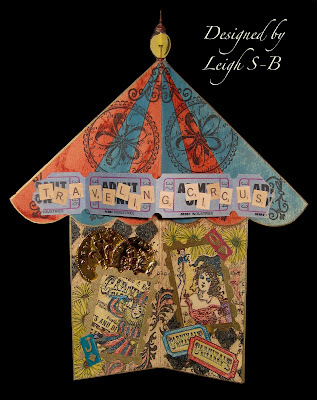 Those tiny paper scrabble letters worked perfectly to spell out 'Traveling Circus' on my Entrance banner. I tore the ends of the banner and adhered just those end bits to the Entrance awning. The banner pops out with the join of the tickets facing outwards. 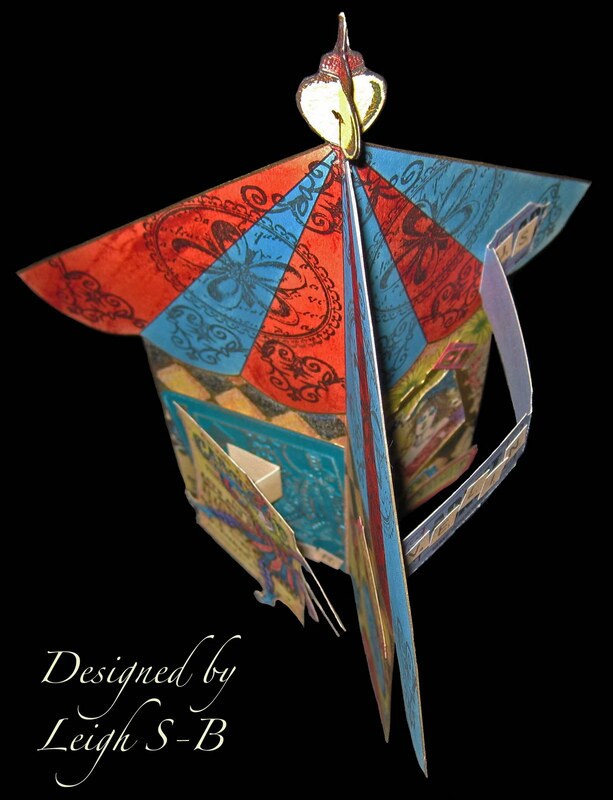 Carnival Bizarre is meant to be displayed in the round but it can easily be flattened for mailing by folding just the Entrance booth in half with the ticket banner pushed inwards. The Queen Fairy and Jester fold flat onto just one side of their booths too so they don't get bent. 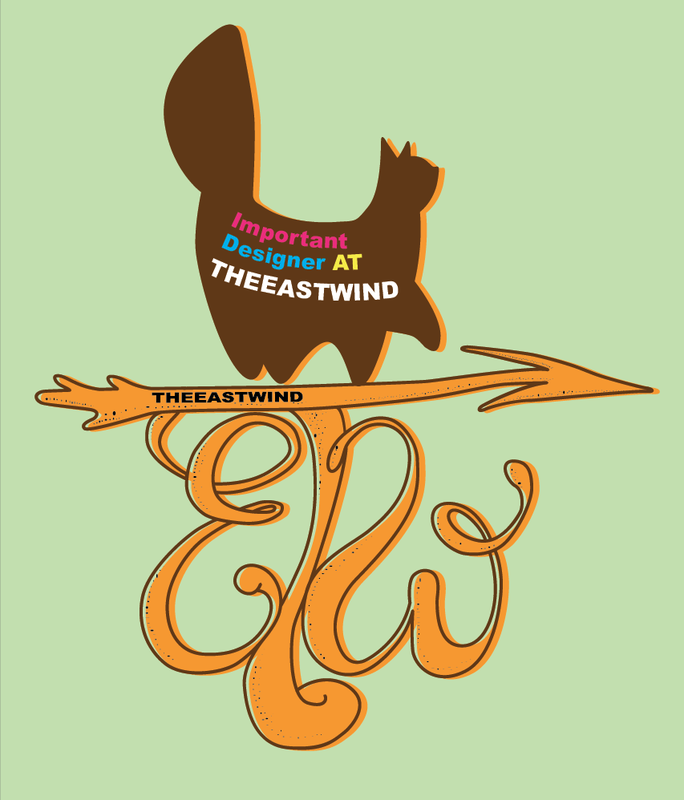 I thoroughly enjoyed designing this piece and I hope you like it as much as I do! 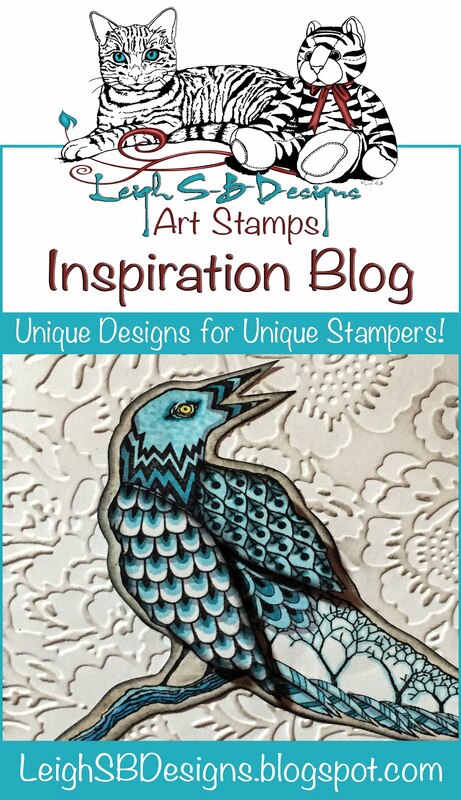 For more Blockheads inspiration check out Karen, my fellow Design Teamster's blog! 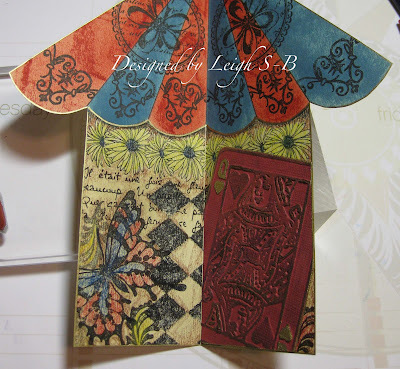 She has a gorgeous Faux Batik Technique to share with you and she also used the Painted Butterflies stamps! Wow!! This project is so totally amazing!! Again, just love the effect you get with the chalk ink and brush. 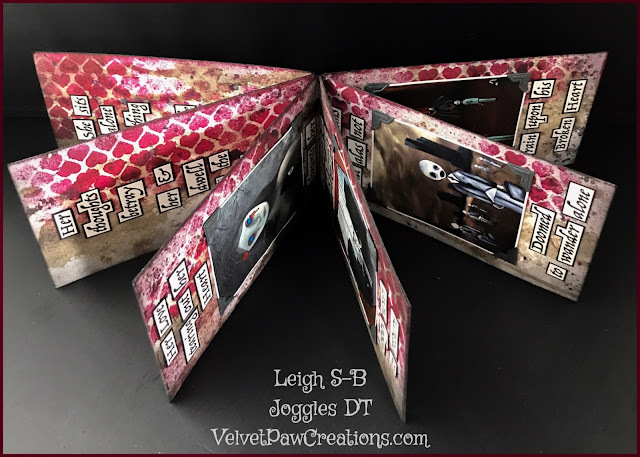 You combined the images is such a great way...they all look like they came from one collection! Really cool template too. Love it!! This is fantastic! It must have taken ages to make and then to write out all the instructions like that - you are one amazing lady. Thank you for being You and sharing your talent so readily. 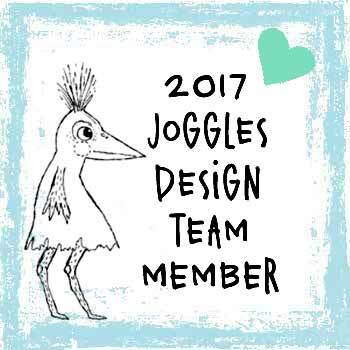 Thanks, I'm pleased you all like my latest project ;0) I've created a new page on my blog just for templates and have added the Carnival Booth template there! Enjoy! Once again your work is phenomenal!!! You have a great eye for detail. This awesome!! Thanks for the great tutorial! I have been loooking for something like this,adn am glad I found it!! WOW that is incredible! 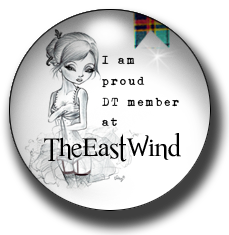 TFS this wonderful project with us all.